Originally published here by Ilana DeBare. 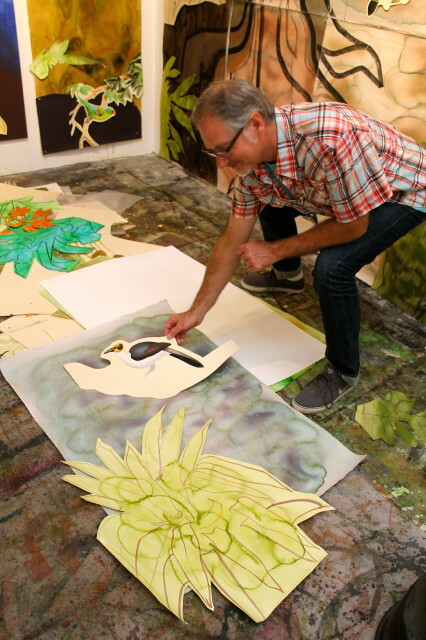 David Tomb’s two childhood loves were art and birds. As an adult, he’s brought them together — in a way that supports international bird conservation. 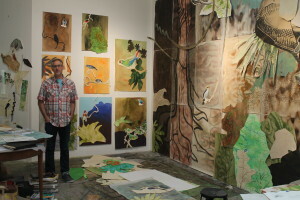 Tomb — a San Francisco painter and collage artist — currently has a show at the San Francisco Public Library focusing on endangered birds of the Philippines, including the majestic Philippine Eagle. It’s part of an initiative to showcase endangered species in the Third World, and raise both money and awareness to help them survive. Together with several childhood friends, Tomb runs a small nonprofit called Jeepney Projects Worldwide that so far has used art to spotlight the Tufted Jay (Mexico) and Horned Guan (Mexico-Guatemala), as well as the Philippine Eagle. “I’d always wanted to paint birds. As I started traveling more and getting out into the field, mostly Mexico, I thought, ‘What can I do to help?’” said Tomb. Tomb started birding as a boy in Oakland and then Marin County, where he fell under the spell of the late birding legend Rich Stallcup. He took part in his first Christmas Bird Count at age 11 in 1972. 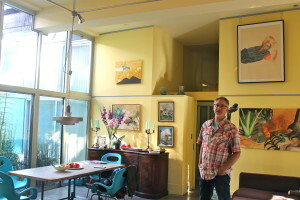 For the first twenty years of his career as an artist. Tomb focused on painting people. He aspired to paint birds, but couldn’t figure out how to forge the same personal connection he had when using live human models. “I would look at photos of birds and think, ‘What am I going to do with that?’” he said. Several years ago, he took the plunge. He decided to try using museum collections of bird skins as his models. But he didn’t want to simply create straightforward field guide-style images; he wanted to add something personal to the work. 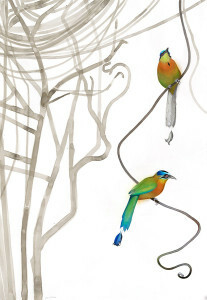 So he evolved a style that combines realistic birds — painted at their actual size — with a more abstract background. 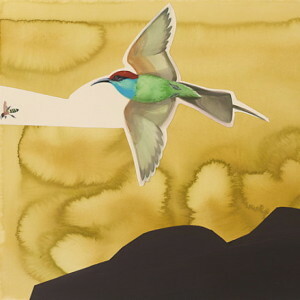 Tomb has done sketches, paintings and prints of birds, but the SF Public Library exhibit focuses on collage works. Tomb starts by doing numerous bird sketches from museum skins. Then he rubs the back of the sketch onto white paper with the back of a spoon. He redraws the image about ten times, experimenting with poses and positions – “kind of Frankensteining and willing that image to look more and more alive,” he said. Only then does he go online to compare his image with photos of the bird. Once he’s satisfied, he paints the bird and cuts it out. 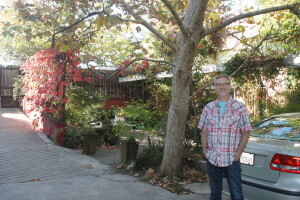 He also paints and cuts out elements of background foliage or terrain. Then he pieces it all together with pins, moving pieces around like a giant jigsaw puzzle. Some of the pieces are left semi-attached and dangling. As he traveled to learn about and paint birds, Tomb was inspired to help protect them. His first project was a benefit for El Triunfo Reserve in Mexico, home to the Horned Guan. 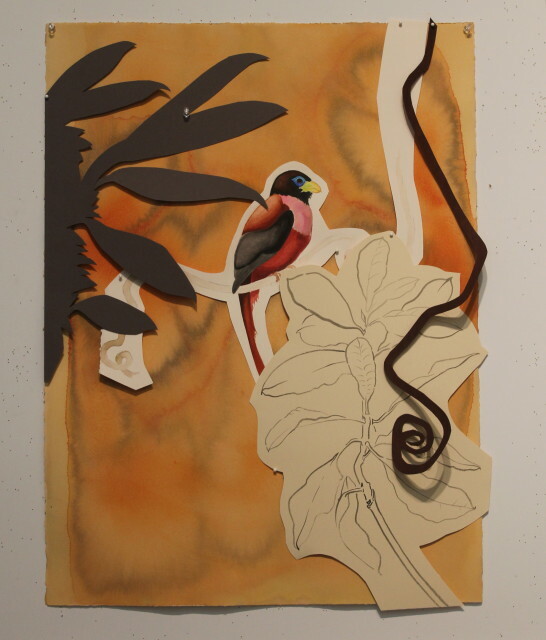 Tomb created prints of the guan and the Resplendant Quetzal and donated the proceeds to the reserve. His friends suggested creating a formal group – which became Jeepney (named after the World War II military vehicles that were recycled into colorful public transit in the Philippines). “We are a tiny group with a big name,” Tomb joked. Tiny or not, they have raised about $3,000 for the Philippine Eagle Foundation and a similar amount for El Triunfo. 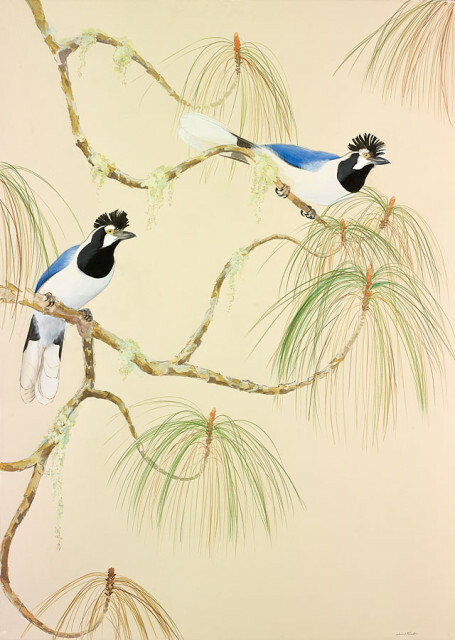 Tomb recently started selling Tufted Jay prints to benefit Mexico’s Tufted Jay Reserve. 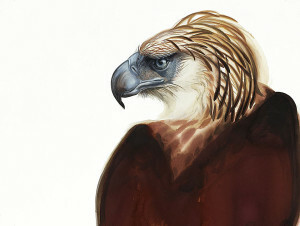 And he’s developing new works featuring the picathartes (rockfowl) of Ghana that could become Jeepney’s next campaign. 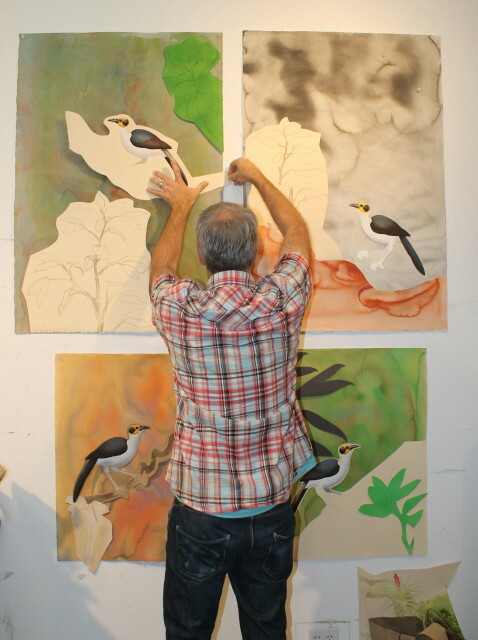 Picathartes right now dominate Tomb’s studio in San Francisco’s Mission district. One entire wall is covered with a giant collage, leaves and vines of the Ghana rain forest pinned up as high as the ceiling. Varied images of picathartes dot the opposite wall, while arm-wide paintings of vines and foliage lie on the floor, tables, chairs. Almost as fascinating as Tomb’s work-in-progress is the place where he does his work — a former police precinct station near 24th Street. Tomb bought the property fifteen years ago when the city was consolidating its police facilities. At the time, it had an extra-thick concrete parking lot for squad cars and not a single stalk of vegetation. But today, when you enter through the nondescript gate, you feel like you’ve stumbled upon a secret garden of Eden. A California Sycamore — planted by drilling a hole through the concrete — spreads its shady canopy over the compound. Grape vines twine their way behind raised beds of California native plants. Tomb’s family, his brother’s family and his studio occupy the former police buildings. 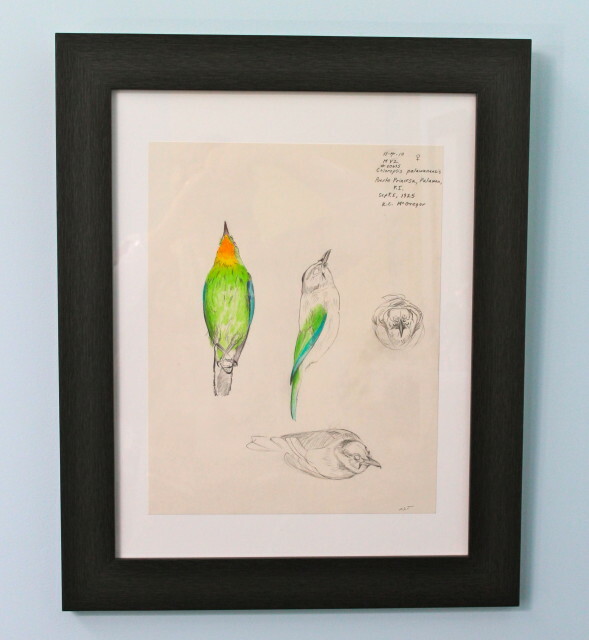 Renovated to look more like a SoMa loft space than a jail cell or locker room, Tomb’s home is lined with his bird sketches and paintings. But there are even more birds outside than inside. The landscaping — all done without removing the thick concrete — draws nesting Mourning Doves each year. It regularly gets Anna’s Hummingbirds, California Towhees, Townsend’s and Yellow-rumped Warblers, and flocks of Bushtits. One highlight last year was a McGillivray’s Warbler on the same day as a Red-breasted Nuthhatch. You can view more of David Tomb’s work at davidtomb.com, or learn about Jeepney Projects Worldwide and its conservation initiatives at jeepneyprojects.org. The Jeepney site includes an online store where you can purchase prints or note cards to benefit Jeepney’s international conservation partners. David Tomb’s exhibition at the SF Public Library is free and open daily through March 2014: Click here for details.